The Pinotage Club: Striking a blow against conventional tyranny! "The most important reason to drink Pinotage is because it is enjoyable. Another is that it is red. Somebody once said that the first duty of wine is to be red. That it has health benefits when consumed in moderation is a bonus. Study after study has shown that the moderate consumption of red wine could be beneficial to your health. Red wine contains high concentrates of resveratol, an anti-oxidant that shows abilities to reduce the risk of cancer and heart disease. And why Pinotage rather than other red wines? Because it is different, because it is uniquely South African, because it allows you to strike a blow against the tyranny of the conventional." 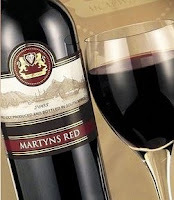 South African Martyn and his Chinese business partner Liu Lian have created Martyns Red, a wine made especially for the Chinese market. It is 50% Pinotage, a variety Martyn thinks is suited to the Chinese palate, blended with Shiraz, Merlot & Cabernet Sauvignon. Peter, this sounds like an exciting development for sure. If Pinotage (or blends thereof) break into the Chinese market, that could help the grape secure an even brighter future. Of course it is not lost on me that the smoky leather found in many Pinotages is so very reminiscent - to me, at least - of Lapsang Souchong tea.